Clara Lazen is the discoverer of tetranitratoxycarbon, a molecule constructed of, oxygen, nitrogen, and carbon. It's got some interesting possible properties, ranging from use as an explosive to energy storage. Lazen is listed as the co-author of a recent paper on the molecule. But that's not what's so interesting and inspiring about this story. What's so unusual here is that Clara Lazen is a ten-year-old fifth-grader in Kansas City, MO. 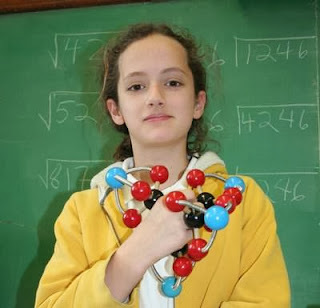 Kenneth Boehr, Clara's science teacher, handed out the usual ball-and-stick models used to visualize simple molecules to his fifth-grade class. But Clara put the carbon, nitrogen, and oxygen atoms together in a particular complex way and asked Boehr if she'd made a real molecule. Boehr, to his surprise, wasn't sure. So he photographed the model and sent it over to a chemist friend at Humboldt State University who identified it as a wholly new but also wholly viable chemical. The chemical has the same formula as one other in HSU's database, but the atoms are arranged differently, so it qualifies as a unique molecule. It doesn't exist in nature, so it'd have to be synthesized in a lab, which takes time and effort. So Boehr's friend, Robert Zoellner, wrote a paper on it instead, to be published in Computational and Theoretical Chemistry. Listed as a co-author: Clara Lazen. Boehr says the discovery and subsequent publication has incited a new interest in science and chemistry at his school--and Clara seems particularly pleased, saying she's now much more interested in biology and medicine.